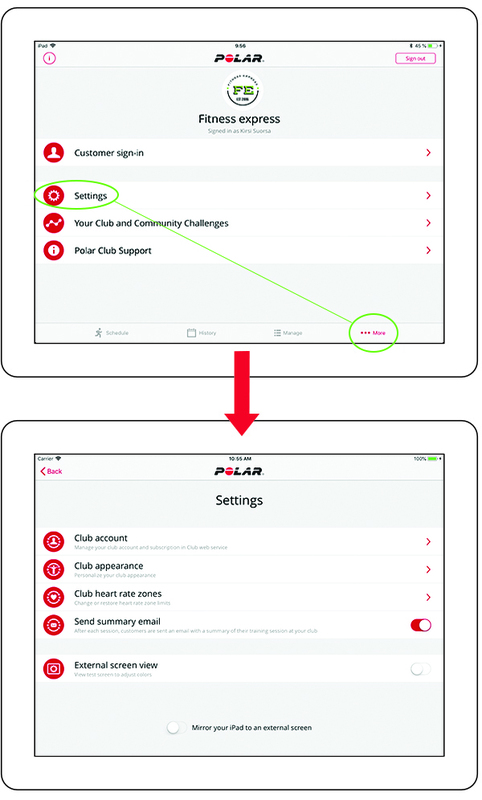 In the Polar Club app, go to the More menu and choose Settings. Use the slider at the bottom of the Settings view to enable or disable mirroring of your iPad screen. When mirroring is enabled, the screen content shown on your iPad is automatically mirrored to an external screen when you connect your iPad to a video projector or TV. You need a suitable AV adapter and a cable to connect the iPad to a video projector or TV. 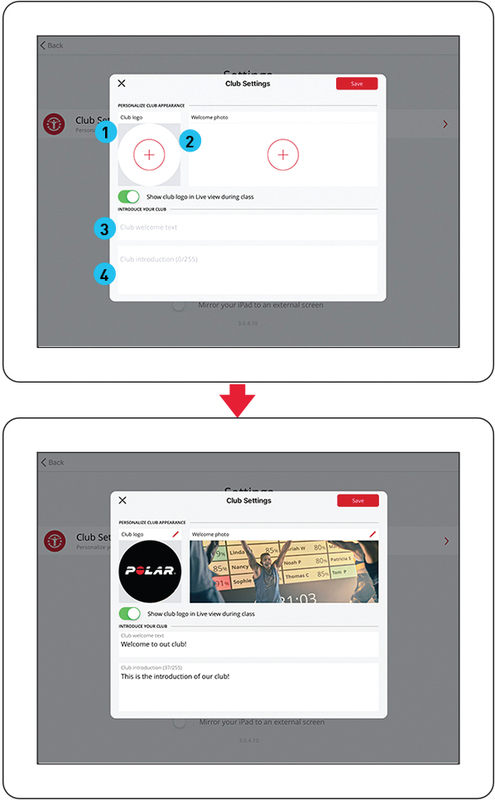 In the Polar Club app, go to the More menu and choose Settings > Club appearance. Club appearance settings are visible for the club admin only. Add Club logo: The club logo is shown on your club community page in the Polar Flow web service. You can also enable to show the club logo in the live view during classes. In the live view, your club instructors can enable or disable the logo from the cogwheel menu on the top right-hand corner of the screen. Add Welcome photo: Make the community page your own by adding a photo showcasing your club. Club welcome text: Write a welcome text for your club members. They will see this text on the sign-in page of the Polar Club iPad app when they sign up for classes. Club introduction: Write an introduction of your club. This text appears on your club community page in the Polar Flow web service. Change or restore heart rate zones. This setting affects how colors / heart rate percentages are shown during the training session. Heart rate zone settings are visible for the club admin only. Use the slider to turn the feature on or off. View a test screen to adjust the colors on the external screen.